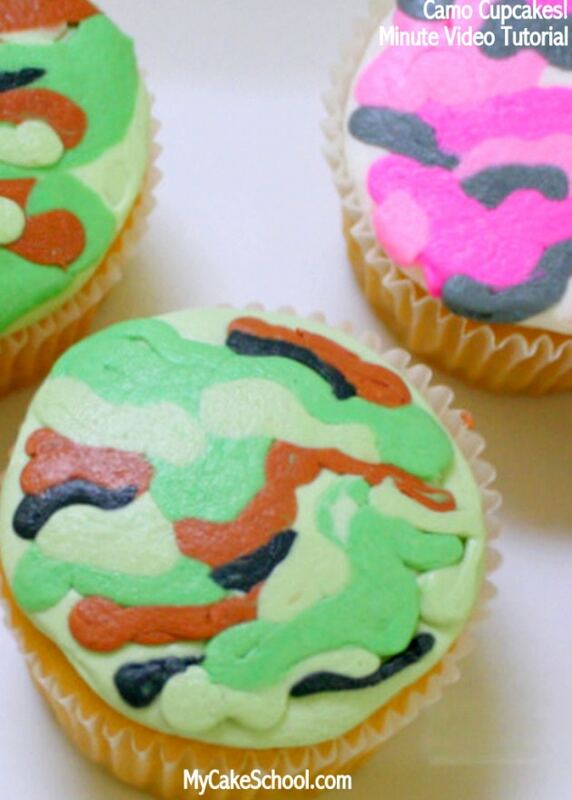 In this quick and easy tutorial, we will show you how to make buttercream camo cupcakes! 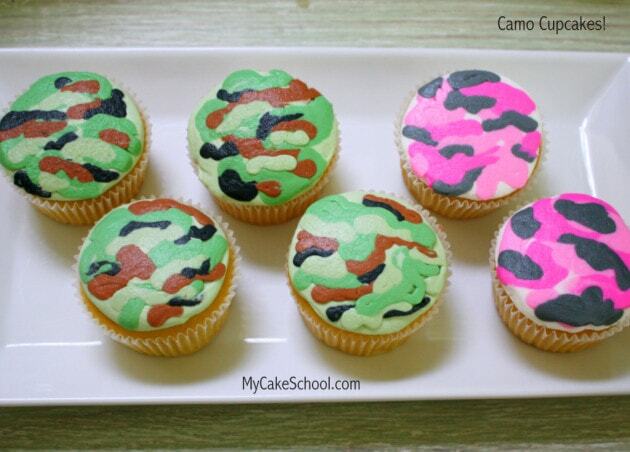 These camouflage cupcake designs are so simple to make. We’ve chosen a realistic camo pattern as well as a fun pink version! As you can see in the video tutorial, crusting buttercream can easily be smoothed with a paper towel. We prefer to use Viva brand paper towels for smoothing because they are nice and smooth with no quilting or impressions. If you are working with a non-crusting frosting, you can still use a similar piping technique for the camo buttercream, but it will just be more textured since you will not be able to smooth over it. We think that these came out so cute, enjoy the tutorial! Crusting Buttercream Frosting like our Fluffy Vanilla Buttercream or Classic Vanilla Buttercream! Piping Tips: Small round tips are great for piping your camo “spots”– I used Wilton 3 tips. For the base frosting, you can spiral on your frosting with a 10 or 12 tip…or just snip the end of a piping bag and go without. Wait 3-5 minutes until the frosted surface has crusted (it shouldn’t come off on your fingertip when lightly touched). Then smooth over with your paper towel. Don’t frost a cake or cupcake that is frozen as the condensation will prevent crusting. In the tutorial, I pipe my base light green frosting, allow to crust for a few minutes, smooth, then pipe the different shades of camo, waited a few minutes for it to crust, and then smoothed again. This process moves quickly if you are working on several at a time. Thanks for stopping by! We hope that you’ll give these buttercream camo cupcakes a try! Interested in experimenting with other crusting buttercream designs? This Buttercream Leopard Print Cupcake pattern uses a very similar technique! Find the free video tutorial here! 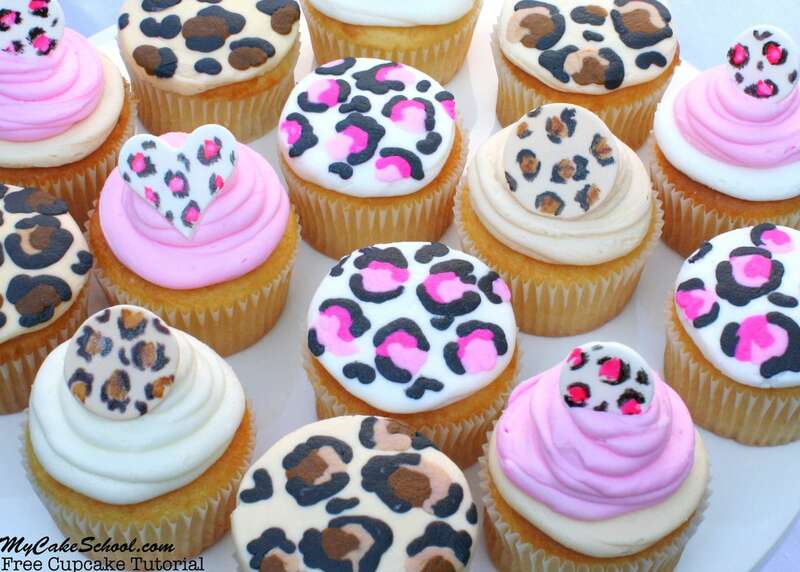 : Buttercream Leopard Print Cupcakes. Very cute! Love the pink version too!